Crisis Investing I : BUY what and when? When GOLD and SILVER bottom they will still be there. The only thing is, when this world deleveraging bottoms, not a lot will be left. The problem is how to survive it. Aside from dealing with the certain political and social chaos and those dangers when the US Dollar and other paper currencies collapse, you need to move your money into paid off real assets. It’s conceivable that some stocks in real assets like (gold & silver) mines would do well too. Stocks and financial products in general, like annuities, bonds, saving accounts, etc. will be destroyed in value because, in an economic depression, companies either go out of business or shrink and Fiat paper money/debt is hyper inflated. In a currency crisis a Social Security check, a bank CD, a Treasury bond, an insurance annuity becomes worthless. That is the reality. To escape losing all your income and losing all your wealth in a currency crisis, you must diversify in other currencies, and also in paid off real ASSETS that will still be there after the currency is destroyed. Obviously, gold and precious metals figure in here. The falling prices right now are quite beside the point. Any investment opportunity can be valid as long as it is fully paid off and preferably out of reach of the authorities. Posted November 7, 2008 : SALES…Gold and Silver shares [ click for today's prices] are on sale: from - 50% to - 95%! Forget Cheap Oil. The world faces mounting uncertainty and escalating costs on the energy front in the years ahead, as companies scramble to find new pockets of oil and squeeze more production from aging fields, the International Energy Agency says in a largely gloomy annual report. The agency says the recent slump in oil prices won't last and "current global trends in energy supply and consumption are patently unsustainable." 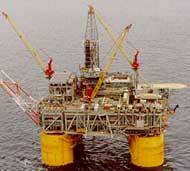 Any idea how much a drilling platform costs a day? Technically, Oil shares need to break through the 50 day moving average and to break through the downtrend on the Point & Figure charts. November 7, 2008 there is still a lot of volatibility but this could be a bottom. Note: the above list is to be seen as informative only and shares should only be bought after consultancy with a financial advisor.